Kirk Rd. & Pine St.
Born and raised east of the Los Angeles river, Las Cafeteras are remixing roots music and telling modern day stories. 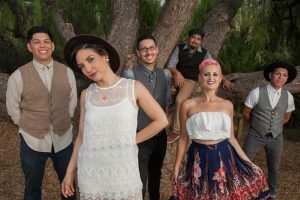 Las Cafeteras creates a vibrant musical fusion with a unique East LA sound and positive message. Their Afro-Mexican beats, rhythms, and rhymes deliver inspiring lyrics that document stories of a community seeking love and justice in the concrete jungle of Los Angeles. Using traditional Son Jarocho instruments like the jarana, requinto, quijada (donkey jawbone) and tarima (a wooden platform), Las Cafeteras sings in English, Spanish, and Spanglish and add a remix of sounds, from rock to hip-hop to rancheras. Las Cafeteras uses music as a vehicle to build bridges among different cultures and communities, and create ‘a world where many worlds fit’.